As I am unpacking my bags from Costa Rica, I’m realizing how much progress I have made this year in moving from “survival mode” of being a working single mom with two kids, to getting my head above water and having the time and energy to plan, organize, and simplify. Of course there is evidence of this all around, so it’s funny to say what made me have this thought: Sunblock! Every summer since I’ve had the kids I would buy several bottles of sunblock which ended up scattered throughout the house in various boxes, bags and closets. Last year during some cleaning I gathered it all together, and was dismayed to find over 20 bottles!! Some probably 10 years old! Not only did this show me how things were chaotic and messy behind the closet doors of my house, but also showed me a huge waste of money. Sunblock is expensive!! I probably threw away about $200 worth that was old and expired. When we were planning our trip to Costa Rica I almost fell into the same trap. I was at CVS and was going to buy some, but then I hesitated. When I looked at home, I found several (recent) bottles that were plenty for our trip. Done! I also found the mosquito repellent so I didn’t need to buy it again. I’m doing some good spring cleaning today!!! And getting rid of some stuff!!! So far I have a big bag of trash, and a big bag of giveaway. 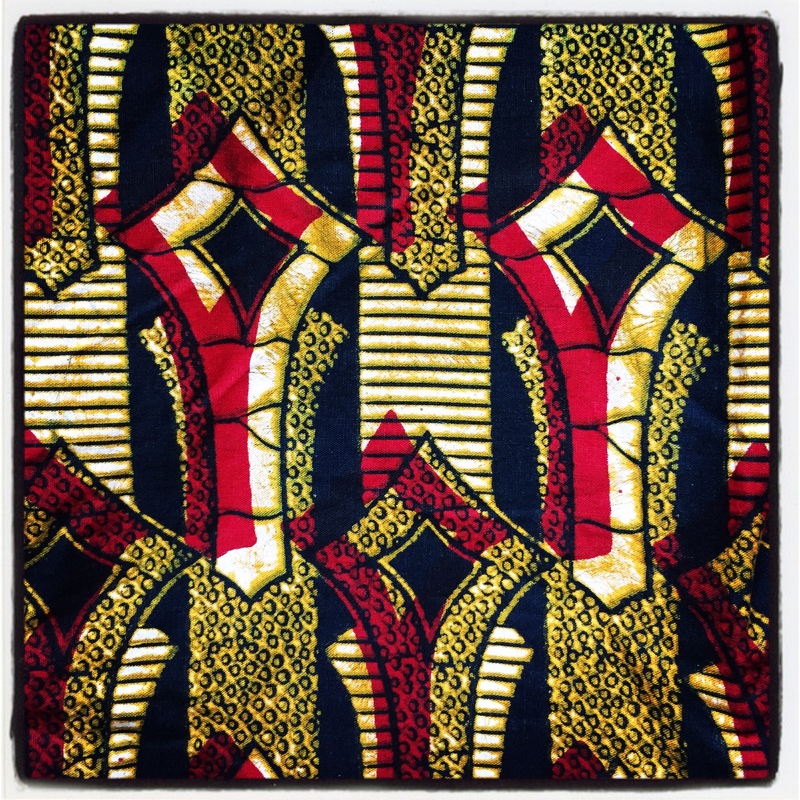 In the giveaway so far I’ve successfully let go of five paid of shoes, about $300 worth of oil painting supplies (that I haven’t touched in 10 years) and many beloved African print skirts and tops that I’ve been holding out for more than 20 years. In the bag of trash is my popped air mattress that I have not been able to patch. This is frustrating, but I’m ready to give up. Plus, my friends bought me a replacement one. Today a friend of mine asked me about the scanner I bought last year. Wow, I don’t know how she knew, maybe I posted something on Facebook, or maybe I happened to mention it to her. She’s going to buy the same one and try to reduce her stacks of papers. She’s got 5 kids, so I can’t even imagine!! Anyway, I haven’t scanned anything in a while, so my stacks have grown again. At the end of my vacation I have a few days when the kids will be back in school and I’ll be home. I’m going to try to use those days to do some serious decluttering, including major scanning and recycling!!! I started packing for my vacation, and when I pulled out my box of summer clothes I could see all the skirts and dresses that I haven’t worn in years. 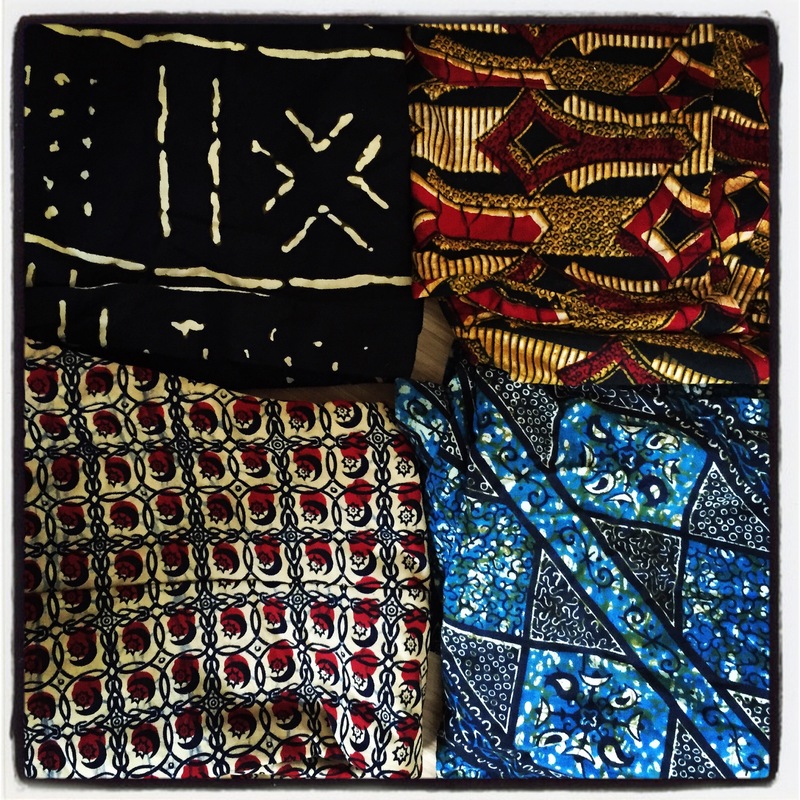 For example, I have at least 3 skirts that were tailor made for me when I lived in Senegal, and well, that was more than 20 years ago. I never wear them. They actually still fit, and the fabric is beautiful, but the styles have changed a lot and when I think about it now I realize how dated they are. I’ve always had trouble letting them go, but when I saw them this time my immediate reaction was, Why am I keeping these? Get rid of them! I’m excited to lighten up. I also have some work clothes that I think I’m ready to pass along. And some extra shoes. I have a pair of sandals that had a velcro strap and the velcro ripped off. This seemed like a fairly easy repair so I held on to them. But then when it came time to pack for my vacation I quickly ordered a new pair so they’d arrive in time. Oh well, I’m not really the kind of person that sews and repairs things, I have to admit. So replace, and recycle. I’ll keep you posted! Well, since I have not been very successful at the decluttering this week, I’ve decided to move into organizing the clutter instead. 2) I’m super excited about this one. I decided to turn my kitchen closet into a pantry. Since apparently I can’t stop myself from hoarding food, at least I can make more room for it and keep it organized. This is normal, right? I mean, most families who cook have a pantry if they can, right? I bought an Elfa system from The Container Store for behind the closet door. I’m a little disappointed that the larger baskets don’t fit because it’s a very narrow door. But I’ll have to make do with the smaller baskets, and will have more room to store extra cans, cereals, oils, etc. My kitchen is really tiny, so the extra storage will help. I know it’s not New Year’s yet, but I’m inspired so I got an early start on my kitchen decluttering! COMPLETELY packed. One thing is I have a lot of things in there that most people don’t freeze, like rice and flour, because in the past I’ve had pantry moths. I don’t think I have those moths anymore, so I took some of those things out. I moved a lot of the dried food into large mason jars, such as the brown rice, the cream of wheat. I hope there isn’t any moisture inside or it’s going to get moldy, fast. The outside of the bags sure were wet. I realized I had more raw sunflowers then I will ever eat in this lifetime, so put a bags worth outside and made some squirrels very happy. 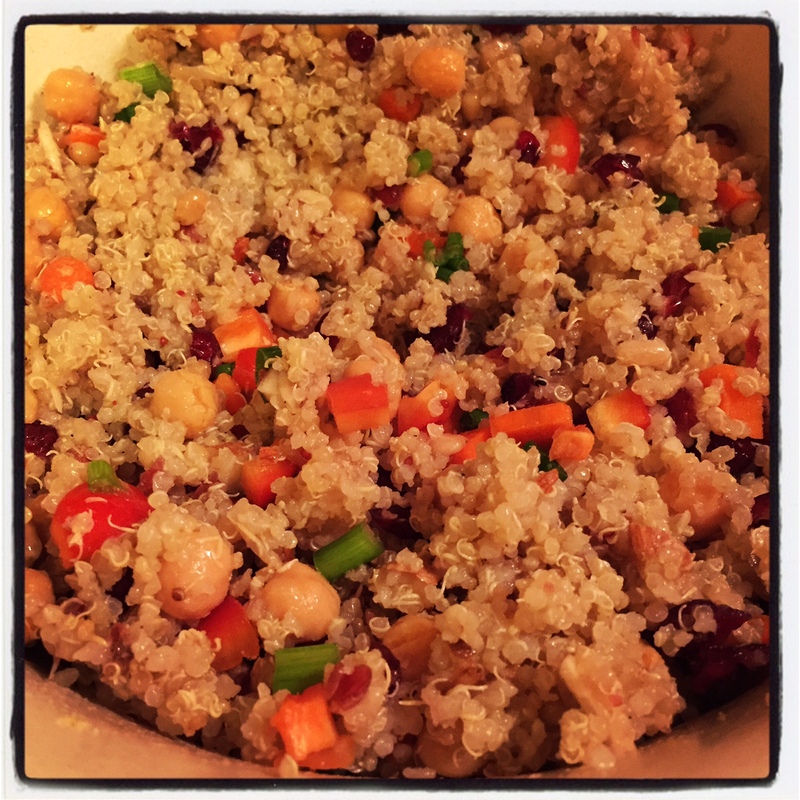 I cooked up an impromptu recipe for quinoa salad, using up some quinoa, raw almonds, pine nuts, red pepper, canned chickpeas, and olive oil. My first attempt to use up some of my stored food. I also added craisins, carrots, scallions, and white balsamic vinegar which I bought for the dish. It turned out delicious!! AND I made extra to freeze (I feel so organized!) For the portion that I ate I added fresh cucumber, tomato and avocado. Yum : ) I’m really tempted to replace the pine nuts, but I’m going to try to hold off. 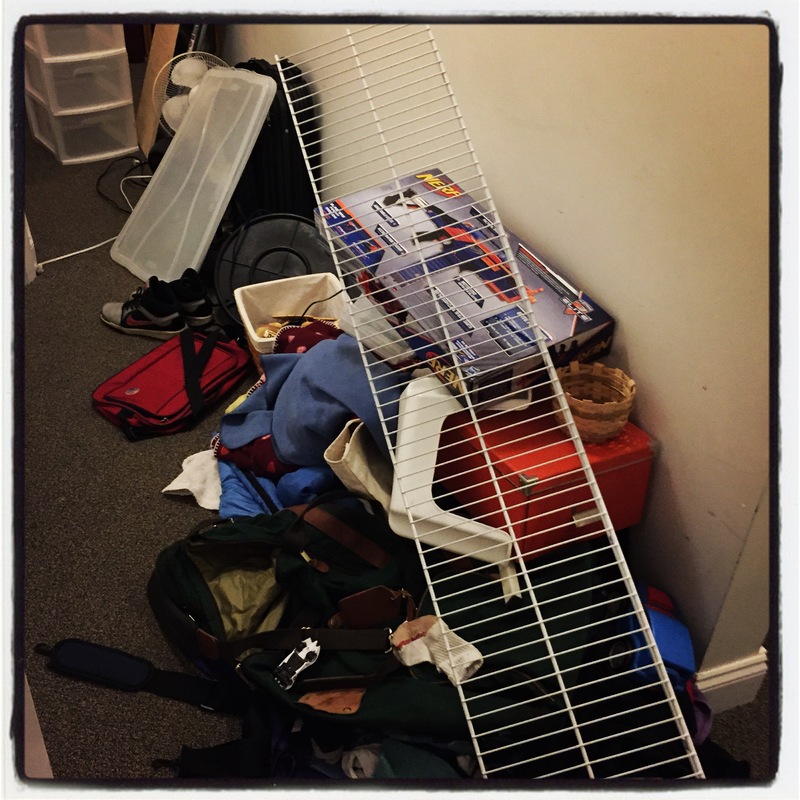 365 Challenge Day 193 – Decluttering? As I mentioned yesterday, in the New Year I would really like to focus some energy and effort on spending less money, which means cooking more, and packing a lunch. Part of this goal is going to mean using up some of the stuff that’s already in my kitchen, instead of always buying more and adding. 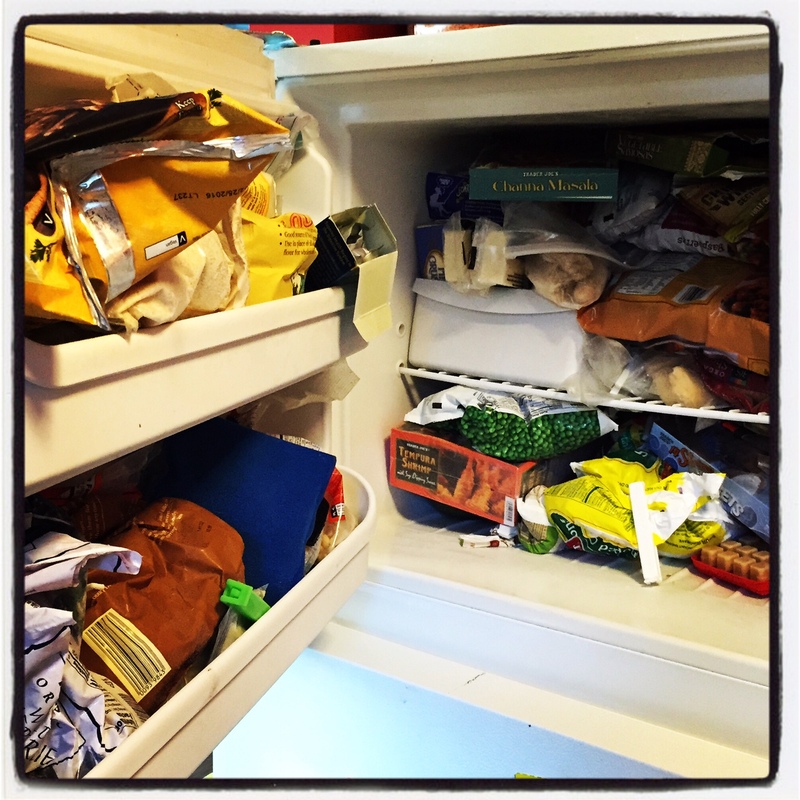 My son put it bluntly when he opened our freezer one day and said, Mom, we’re hoarders. I’m actually not that bad, compared to many. I have a very small kitchen which is probably for the best. I don’t have a pantry, I don’t have a freezer in the basement, and I don’t have a double doored fridge (although I’d love one : ) I probably miss out on some deals by not being able to stock up on stuff when it’s on sale, but since I’m pretty disorganized I know if I had a basement freezer full of sale items they would probably stay there forever. But I do have a bit of a stockpile. Either I have some kind of a fear of famine, or my lack of organization just makes me buy two or three of everything so I won’t have to worry about having nothing to eat when I haven’t planned ahead. I have bags of pasta buried at the back of the cabinet. I have some dried food that I don’t really know what to do with (like purple “forbidden” rice, and adzuki beans) and I have a freezer so packed I don’t even know what’s in there. I’d like to use this stuff up!!! A sort of decluttering of the cabinets and fridge. But here is my problem, I’m bad at this!! I say I want to declutter the kitchen, but I simultaneously want to be better about using coupons and buying stuff on sale. I realize these two goals are in opposition to each other!! And here is another problem, I could have something laying around for two years and the minute I use it, decide it was good, I will go out and immediately buy it again!! For example, I just cooked some steal cut oats, which I bought… a while ago. I put in some raisins and apples, cinnamon, and topped it with some pecans that have been in freezer for so long I don’t even remember buying them. It was delicious!! Not only am I tempted to buy some more pecans, but I’m tempted to buy some new mason jars so I can easily pack up 5 portions of my oatmeal to bring to work everyday. That could actually be a smart thing to do. ARGH. This is confusing.